The Ford Focus is an established veteran in the towing stakes, and it grabbed our attention with its sleek appearance. But there’s plenty to please inside as well. Compared to its predecessor, this Focus promises improved economy and emissions as well as sharper styling. We tested the 2.0 TDCi Titanium, priced at £20,845. First and foremost, we hoped for unshakeable stability and performance on tow. And, because this class of car is popular for everyday duties, we’re looking for a pleasant drive without the tourer solo drive, a practical cabin and low running costs. 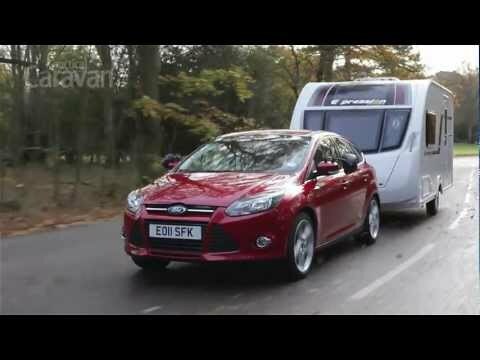 With a kerbweight of 1421kg, the Ford Focus can provide a safe and stable match for caravans weighing 1208kg or less, under the 85% guideline. Its legal towing limit is 1500kg and towball limit is 75kg, while it produces 138bhp and and 236lb ft of torque. For our Practical Caravan tow car test we hitched the Focus to a Swift Expression 442, whose plated mass in running order (MiRO) was 1129kg. First, we measured acceleration times, which were 13.6 seconds to go from 30-60mph, and the same for speeding up from 50-60mph in fifth. The Ford comfortably held 60mph in sixth gear on a level road, although dropping to fifth was necessary on a motorway incline to hold the legal limit. Likewise, this small hatchback performed well in our hill-start test. on a 1-in-10 incline, the handbrake held the car and caravan easily, and the car pulled to the top without complaint. However, the clutch was rather smelly after tackling the same slope in reverse. When stopping sharply, the Ford’s reassuring brakes do the job, stopping from 30mph in 10m. For the emergency lane-change part of our tow car test, the Focus was impressively stable and controlled. The front tyres gripped hard, and the caravan followed obediently like a well-trained pet. Public roads present different challenges from the test track, but the Ford proved itself to be a pleasant tow car to drive and ride in. It outperforms other cars in its class for stability at speed. Breezes along the way did little to disturb its course, freeing the driver from having to correct the steering very much. Keen drivers will enjoy the Ford Focus, thanks to balanced cornering and suspension that combines comfort and control. It’s unfazed by mid-corner bumps, and sharp dips and crests fail to knock the car off its stride. The electrically assisted steering of the third generation isn’t as communicative as the previous model’s hydraulic assistance, but it remains precise and well weighted. Open country roads are traditionally where the Focus feels most at home. However, any car’s most serious test is along urban streets and on motorways. When confined to town, the Ford is comfortable enough, but potholes and other large bumps make their presence felt more than our reviewers like. Despite this, it provides a comfortable and relaxed drive; given its splendid showing with a tourer in tow, our experts expected nothing less. The cabin could be better shielded from road and wind noise, though. Without a van at the back, the Ford’s get up and go is present in spades, thanks to the engine’s respectable power and torque. The Ford Focus is classed as a small family car, and there is indeed enough space inside for a small family to get comfortable. At the front, the Ford offers ample legroom and sufficient headroom for anyone who is neither exceptionally short or tall to find a comfortable driving position. The cockpit is edgy and angular, but the dramatic effect doesn’t contribute to the ease of mastering the controls. Ford has compromised its rear-seat space slightly for a curving, almost coupé-like roofline, which reduces headroom severely. Legroom is acceptable, but the people in the back seats don’t get air vents to keep them cool. The story in the boot is mixed: you get between 316 litres and, when the seats are folded down, 1101 litres of luggage space. The 60/40 split-fold rear seats provide flexibility and, although the seat backs don’t quite lie flat, there is no step in the floor to get in the way of loading long objects. Determined haggling can save you quite a sum on a Ford Focus. Stand your ground with the salesman and What Car?’s Target Price suggests you’ll pay £18,778, more than £2000 below the stated price. Focus buyers get one or two extra toys included in the price. For example, dual-zone climate control is standard. You’ll save money on insurance – the Ford is two insurance groups lower than the Volkswagen Golf, for example – but it is less economical to run than the VW. Official figures put the combined fuel consumption at 56.5mpg, while the VW claims 58.9mpg. Around our towing economy route, the Golf achieved 31.5mpg to the Focus’s 26.1mpg. It is equipped with important safety aids, such as stability control as standard, while having achieved a five-star overall rating from crash-test expert Euro NCAP. Three years down the line, or after 60,000 miles, the Focus will be worth 36% of its original value. For all its strengths, the Ford Focus doesn’t quite manage to knock its rivals into a tin garage. It can tow a handful of tourers that are within an 85% match, but more than many rivals in its class. In addition, the Focus is a thoroughly rewarding car to drive. It’s in its element on B-roads and fast-flowing A-roads, where the punchy 2.0-litre engine and firm suspension come into their own. This is all on top of the Ford’s edgy styling, inside and out. Good looks would count for little if it weren’t a very fine tow car indeed. We found the Focus to be stable and poised with a caravan behind it and that it stops well when called upon in an emergency. Nevertheless, there’s room for improvement: the ride could be more comfortable, the cabin could be quieter at speed and there really should be more room for passengers and their kit. Finally, while the Ford’s resale values and fuel economy are respectable, it didn’t come out on top of Practical Caravan's tow car twin test.